An air fryer is a kitchen appliance that cooks by circulating hot air around the food using the convection mechanism. A mechanical fan circulates the hot air around the food at high speed, cooking the food and producing a crispy layer via the Maillard effect. My son got me an air fryer for Christmas and it has become a staple appliance in my home, especially for my boys. They make french fries cut fresh, they heat up veggie egg rolls to get them nice and crispy, and our latest obsession is crispy tofu. My 12 year old said it tastes just like chicken! The tofu is crisy and while in this picture I cut them into cubes, you could cut them into sticks instead so they are easier to dip into your favorite dipping sauce. The cubes could be coated with a sauce for stir fry dishes, used as croutons in a salad or added to soup. It really does taste like a chicken nugget and so good dipped in BBQ sauce. I will never buy vegan nuggets for my kids again. I also love the ease of cooking my favorite roasted potatoes. My favorite are the little fingerling potatoes or baby red potatoes. They cook in about 15 minutes and are perfectly cooked and crispy on the outside. The best alternative to french fries! Last night I made both the potatoes and the tofu so I pushed the potatoes to one side and put the tofu on the other and they were both done at the same time. I put the tofu cubes into a bowl and sprinkle with the above ingredients and toss to coat. Put into the air fryer at 400 degrees and cook for 10-15 minutes. I shake the tray half way through. If you were to cut into sticks and you were cooking potatoes at the same time I would use the metal rack that would fit over the potatoes and then you could lay out the sticks on the rack. Put the potatoes into a bowl. Add in the olive oil, sprinkle with salt and pepper and toss to coat. I usually massage with my hands to make sure they potatoes are all coated. 15 minutes in the air fryer- shake the tray half way through. When eating potatoes and a plant based protein like tofu (or anything cooked for that matter) I always make sure that half my plate is a salad or raw veggies. 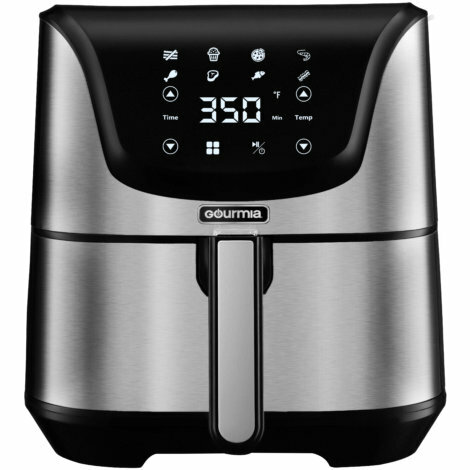 I have the Gourmia Air Fryer with the 6 qt capacity from Costco.